Allolobophora chlorotica, pink morph. Photographed by Harry Taylor, copyright: The Trustees of the Natural History Museum. Inspired by the Natural History Museum’s spectacular new exhibition Colour and Vision, Through the Eyes of Nature, we are sending you on a quest to find a green-coloured earthworm, Allolobophora chlorotica, to add to your species list. Allolobophora chlorotica is endogeic, meaning that it is a soil-feeding earthworm and will be found making horizontal burrows up to 20cm beneath the surface of the soil as it feeds and moves around. 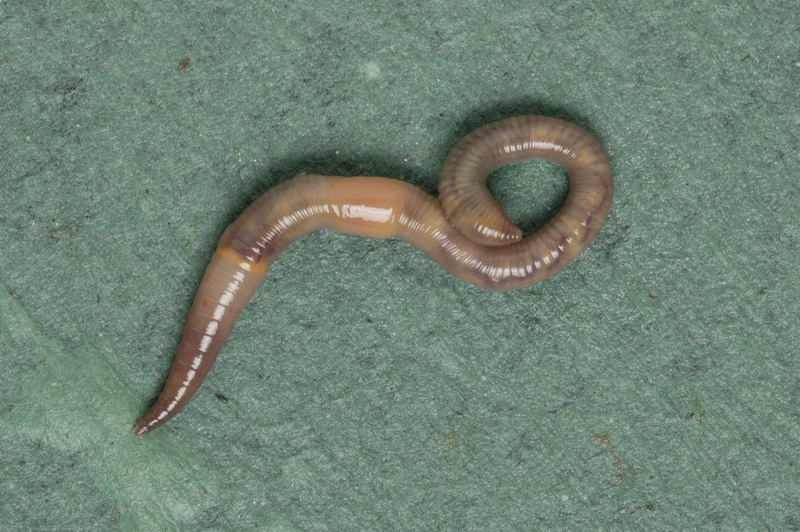 It is a medium-sized earthworm; an adult measures approximately 50mm in length. The adult has a yellowish ring near its head and sometimes it is possible to see three pairs of sucker-like discs on alternate segments on the underside of its clitellum (saddle). You have a very good chance of coming across Allolobophora chlorotica because in a recent comprehensive national survey of earthworms, it was found to be the most abundant earthworm in the UK, making up 34% of all specimens identified (Jones and Eggleton 2014). There is, however, one complication, the earthworm is found in two colour morphs: pale pink and pale green. Genetic research has concluded that the pink morph is dominant (Kalmus et al 1955). Not only are there more pink morphs, experiments revealed that the green colour generally cannot be seen in Allolobophora chlorotica that are under 2cm in length and 4 to 6 months old. In some cases, the change in colour takes place a while after the earthworm develops a clitellum and becomes sexually mature, taking up to a year for the earthworm to turn green (Satchell 1967). All the more reason to celebrate when you find a green morph; be sure to make a note of its length in your earthworm field notebook. Be warned, the earthworm can produce a lot of yellow coelomic fluid if disturbed. Understanding the ecology of the earthworm is helpful in tracking down the more elusive green morph. Populations of entirely pink morphs are found in gardens and woodlands so you will have to explore further afield to find populations of the green morphs. These are found in grasslands, ditches, banks of streams and lakes and amongst the roots of aquatic plants such as reed mace. In northern England, mixed populations of both pink and green morphs have been found in grasslands. Make sure you get the permission of the landowner before you dig for worms. Allolobophora chlorotica that are green possess a bilin pigment. Scientists have postulated a number of theories as to why this is an advantage and why the morph persists. In other words, why it has not slowly dwindled away as it is less genetically dominant. For instance, because the green morph is found in grasslands, scientists thought that that the pigment might protect the earthworm from higher levels of UV radiation; endogeic earthworms blister and perish if exposed to sunlight for too long. However, when this theory was tested, both green and pink morphs responded in the same manner to controlled high-level doses of UV radiation (Satchell 1967). Scientists thought that the green morph might have an advantage over the pink in open grassland, in that it was possibly more camouflaged and therefore less easily preyed upon by birds (Kalmus et al 1955). However, in field observations, including those of mixed populations exposed to the same bird predation, it was concluded that both morphs were preyed upon equally (Satchell 1967). A 1959 survey of 17 sites in northern England supporting Allolobophora chlorotica populations seemed to indicate a possible relationship between soil moisture levels and the distribution of the pink and green morphs. It was found that sites which had a soil moisture content greater than 40% supported populations which were made up of more than 90% green morphs. This is in contrast to the 1955 survey in southern England by Kalmus et al where there was no correlation between soil moisture content and the sites where green morphs were found. It was conceded that the difference in ability between colour morphs to survive dry soil conditions has not been successfully demonstrated in laboratory experiments. A suggestion was made that it may not be simply the soil moisture content that affects distribution of the colour morphs but that it might be availability of the soil water to the earthworms that is important (Satchell 1967). Some soils retain water so well that it is difficult for plants and soil fauna to access it. Perhaps when recording your Allolobophora chlorotica sightings you could also conduct a soil texture test as described on the Earthworm Watch Soil Chart and record your own observations for each site i.e. sandy, loam or clay soil, which could give an indication of the availability of soil water. Once you have been successful in your quest to find your very own, admittedly muddy, pale, but unmistakably green earthworm, do not stop there. We encourage you to go even further afield to seek out the marvellously vibrant green Allolobophora smaragdina that is found in Albania, Austria, Croatia, Germany, Italy, Montenegro, Poland and Serbia. There is a spectacularly blue, 2m long, giant earthworm Terriswalkeris terraereginae to be found in the upland areas of rainforest in Australia. Eutrigaster sporadonephra, found in Dominica, is also an interesting shade of blue, although you will have to look up to spot it as it lives in epiphytic tank bromeliads in trees! How about the flamboyant and otherworldly Archipheretima middletoni, the Fried Egg Worm of the Philippines? You will have to believe your eyes - it is a technicolour annelid world out there… happy hunting! 1Come and Get A Wriggle On! 3Spring showers: why do earthworms emerge in the rain?